A new model for 2014, the 16 CX is one of six models of Legend’s All-Weather Fisherman series of full windshield all welded boats from fifteen to twenty feet. 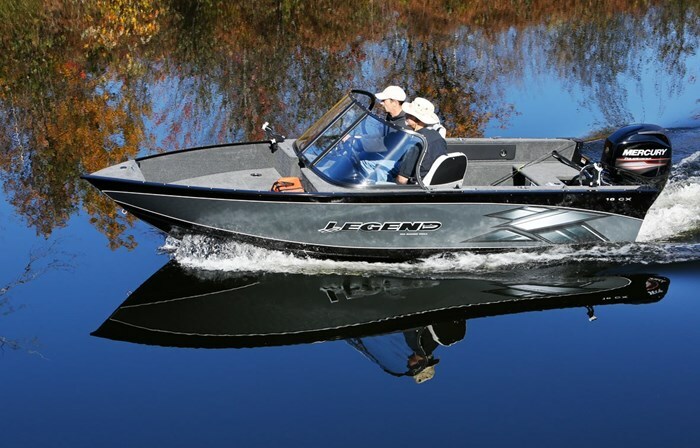 Legend Boats of Whitefish, Ontario near Sudbury offers a total of twenty models of aluminum utility, side console, and full windshield models ranging from twelve to twenty feet. Legend also offers seventeen models of pontoon boats for 2014 ranging from twenty to twenty-seven feet. 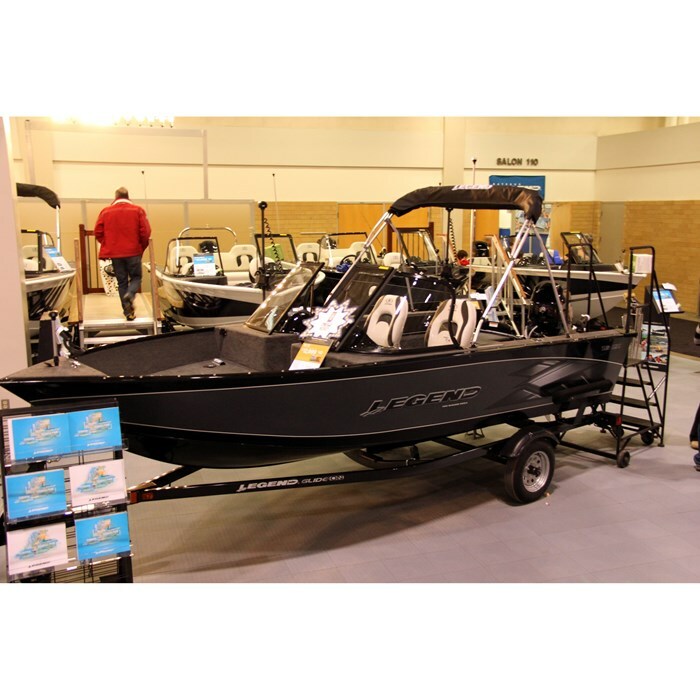 The all-welded 16 CX is constructed with .100 gauge aluminum utilizing a two-piece hull with no side seams and locked into a solid centre and bow extrusion which is over one-inch thick. Injected foam within the hull for strength and sound insulation provides the 16 CX with level floatation properties. A high-gloss oven-cured urethane paint finishes the exterior of the hull and 3M reflective striping is applied not only for daytime graphic appeal but for added night time safety. A Leakproof for Life Warranty comes with this boat. A very high curved three-piece-only windshield, including the centre walk-thru section, aids not only all-round visibility but also good protection from the elements. 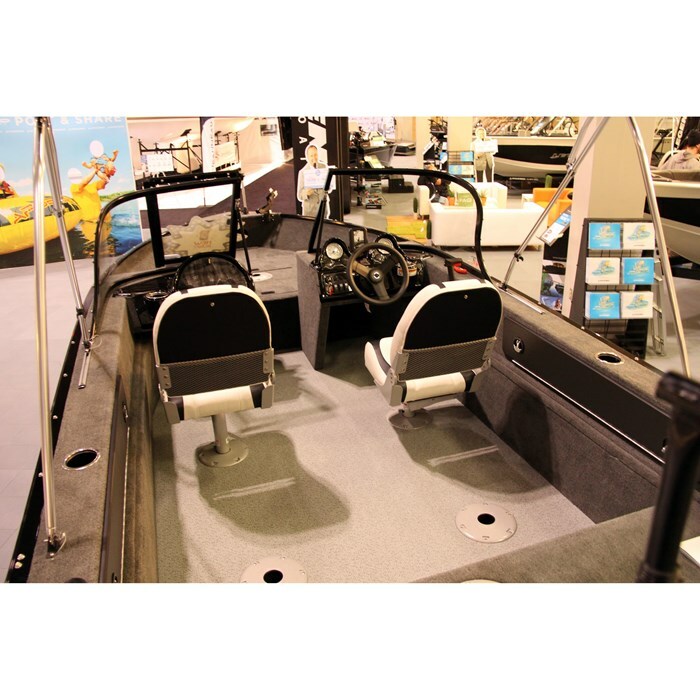 The “Deluxe” passenger console has a high rounded top to accommodate a large glove box while the driver’s “Deluxe Full-Vu” helm console with woodgrain dash has a blank centre section at the top available for mounting your choice of graph fishfinder/GPS unit. This blank centre section is flanked by a standard large chrome-bezeled speedometer and tachometer. Two removable high-back swivel chairs with storage netting on the seat backs come with the 16 CX and these chairs can be located in any of six floor mounts provided – four within the cockpit and one each on the bow and stern casting decks. On each side of the cockpit are integral and lockable rod storage boxes large enough for seven-foot rods. Drop ‘N’ Go rod holders are also provided. Beneath the stern casting deck is more general storage plus space for both the battery and the standard portable fuel tank plus space for a second tank. The raised forward bow section is pre-wired for an optional MinnKota or MotorGuide trolling motor and has additional storage below. 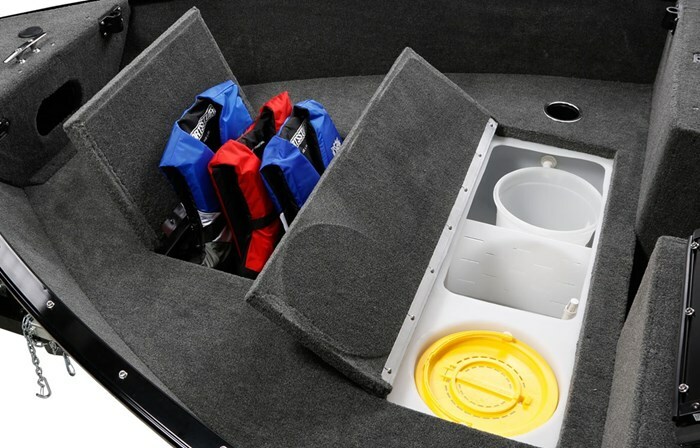 An in-floor storage compartment large enough to hold a trolling motor battery is also found within the bow casting deck as is a 30-gallon aerated livewell with integrated baitbucket and threaded Sure-Lock stand pipe with overflow protection. 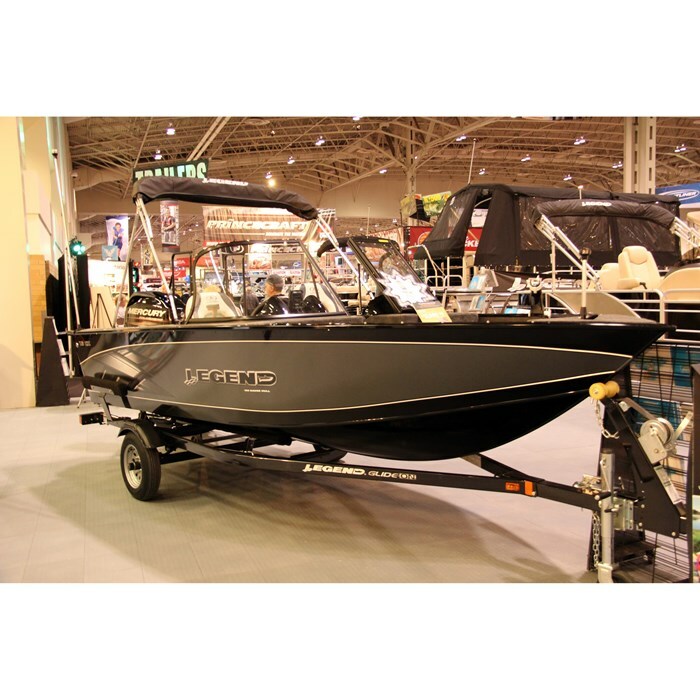 Standard power included with the 16 CX is a 25 horsepower Mercury 4-Stroke which would be ideal for trolling or cruising up to about 22 miles per hour. Five larger Mercury 4-Stroke outboards up to 75 horsepower are available. Each increase in horsepower provides more top speed right up to the 43 miles per hour of the 75 horsepower model. Legend suggests the 50 horsepower Mercury ELPT EFI 4-Stroke as the most popular choice for the 16 CX with its top speed of about 32 miles per hour – quite sufficient for tubing but perhaps not quite enough for waterskiing. Legend offers lots of options from which you can choose in order to personalize your 16 CX for the type of boating you intend to do. First off, a Legend custom-matched Glide-on bunk trailer by Shoreland’r with powder coated paint would be a great choice for getting your 16 CX to and from your favourite fishing or cruising locations. You can then upgrade this trailer with a tongue jack, spare tire, a swing tongue, and tie-downs. For our Canadian boating and climate conditions, you could choose a full stand-up top with full enclosure or perhaps simply the bimini top. You may also want a full boat mooring cover and perhaps a motor cover. Various additional seating options are available including more of the high-back swivel chairs or perhaps replace the driver’s chair with a deluxe reclining captain’s chair, or a premium contour swivel chair, or a utility fishing chair, or even a pro seat to allow standing casting. You could simply add a slider for the standard seat and maybe add an additional floor seat base. For watersports enthusiasts, you can also choose a waterski/wakeboard tow bar and if more serious fishing is your pleasure, a Canon Magnum 10 STX electric downrigger. Legend also makes available complete lines, fenders, and full safety equipment to allow you to go straight from the showroom to your favourite body of water knowing you are properly equipped right from the get-go.